Taiwan Taoyuan International Airport (Formerly Chiang Kai-shek International Airport) is an international airport located in northern Taiwan, within Taoyuan County, Taiwan. It is the one of the two international airports in Taiwan and by far the busiest international air entry point into Taiwan. You can travel to Taipei by bus and taxi. Kaohsiung International Airport is a midsize commercial airport located in Kaohsiung City, in southern of Taiwan. 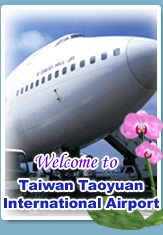 It primary serves as a hub to countries in Southeastern Asia and as the backup to Taiwan Taoyuan International Airport. If you want to travel in Taipei, you can take bus, train or Taiwan high speed rail from Kaohsiung to Taipei.